Bone China isn’t exactly your typical dinnerware, but that’s what makes it so popular. The unique properties of clay mixed with bone ash gives it the appearance that resembles other types of fine dinnerware. The soft paced porcelain undertakes the same manufacturing process of other types of fine China, but is much harder. The durable nature of Bone China has many consumers looking its way and with many different patterns and colors to choose from they’re perfect for any special occasion. Even if you’re looking to give your everyday dinner table a change, there are numerous options that you may not have considered. The following review looks at the Top 5 Bone China Dinnerware Sets in 2018 and all the reasons why we feel this way. 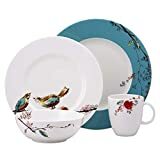 The Lenox Simply Fine Chirp dinnerware set is not only our top choice, but it’s also the top rated Bone China set on Amazon.com. This says a lot as it’s easily one of the most popular with consumers and has received rave reviews. This unique set seats 4 persons and has numerous options from single place settings to single cups. The Simpley Fine Chirp design is perfect for any occasion, but unique enough to accent some of the most traditional holidays such as Thanksgiving and Christmas. The vibrant colors of teal and white along with a colorful birds makes any dinner table setting tranquil. Crafted from Lenox fine bone china and is guaranteed to be chip resistant, oven safe, microwave safe, and dishwasher safe. You can also choose to extend the 4-piece set as you will find virtually every other compliment to the Simply Fine Chirp set. You will even fine the matching salt and pepper shakers, coffee mug, spoon rest, medium plate, oval platter, and anything else you can imagine. The Wedgwood Renaissance Gold is a 5-piece setting which offers a truly unique design. The vibrant colors and perfect blend of blue, white and gold is the perfect option for everyday use, or the most elaborate of special occasions. Renaissance Gold comes complete with a dinner plate, bread and butter plate, salad plate, tea cup, tea saucer. The stunning visuals of the Wedgwood Renaissance was first showcased Wedgwood archive cameo, seen in the pure oval forms. The current price is listed at well over 50% off and Amazon will also give you free two-day shipping. 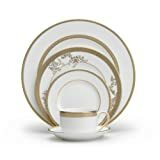 The Lenox Westmore is a bargain beauty coming in at around $70 which is significantly less than other Bone China dinnerware sets. The Westmore is a full 5-piece setting, crafted by Lenox, and features a 24-karat gold trim accent around the edges of all pieces. The dinnerware set is everything you need for formal dining which includes a dinner Plate 10 3/4″, salad plate 8″, butter plate 6″, 6 oz cup and 5 3/4″ saucer. Everything in the set is dishwasher safe and was 100% made in the USA. 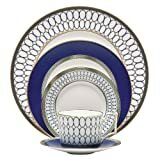 The Wedgwood Vera Lace collection is a 5-piece set which includes a dinner plate, bread and butter plate salad plate, tea saucer, and teacup. This setting is everything you need to give your dinner table a facelift, and backed with the high quality name of Vera Wang you will definitely not be dissatisfied. The Wedgwood Vera Lace dinnerware set is perfect for fine dining experiences, family get-togethers, and special occasions and is very easy to match with other home décor options. The gold accent around the rim gives it the opulence and grandeur look that you may be looking for which is the first thing people will notice when they sit down. The Lenox Winter Greetings is a large 12-piece set, and as the name says it all is the perfect winter holiday dinnerware set. The quality that goes into the Winter Greetings set which was superiorly crafted of Bone China and has a 24-karat gold accent. If you’re looking for a smaller set than 12, you can choose one of many options including a complete 5-piece set or choose to shop individually. The Winter Greeting set is dishwasher safe, but like most China it’s not microwave safe. If you have anything you would like to add on the best Bone China Dinnerware Sets in 2018 , or if you have a question, feel free to let us know in the comment section below or reach out to us on Facebook.